It’s a brain dump day. Random stuff falls from my head in bits and pieces. Why do men married to powerful women always get portrayed in the media as whiney, needy irritations? A powerful man probably didn’t get where he is without a good spouse behind him. Why should a powerful woman get where she is without a good spouse behind her? Enough with this whiney-husband-of-a-woman-in-power trope. Come on State of Affairs , you can do better. All female Ghostbusters . Yes! To the men who had the nerve to say that this ruins Ghostbusters for them, I say, “Sod off, you dozy pillocks!” Oops, I’ve been watching too many British dramas. I watched After the Wedding on Netflix. The original title is Efter brylluppet. I enjoyed it very much. It’s an interesting plot and well acted. The film is in a mix of Danish, Swedish, Hindi and English. Part of it takes place in India, part in Denmark. The main character is played by Mads Mikkelsen, but I decided to watch it because of the wonderful Sidse Babett Knudsen. If you enjoy foreign films, you may like this one. It was nominated for an Oscar for Best Foreign Language Film of the Year in 2007. Thanks to A Celtic-Dragon’s Blog for turning me on to Five Days . This British mystery series, written by Gwyneth Hughes, had a season in 2007 and another in 2010. Each series is 5 separate days from a police case. There are wonderful actors: Penelope Wilton, David Oyelowo, Janet McTeer, Hugh Bonneville, Suranne Jones, Anne Reid, Nina Sosanya and many others. I didn’t find anywhere that you can stream it, but Five Days, series 1 is available from Amazon on DVD. 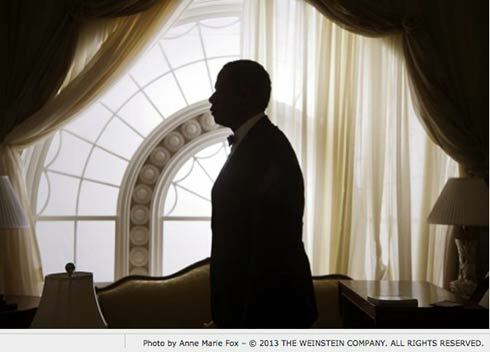 Lee Daniels’ The Butler is one of the most powerful films I’ve seen in a very long time. It’s like watching a newsreel of my own life. It is a newsreel of my own life. It was especially meaningful to watch it on Sunday as the nation remembered the 50th anniversary of the 1963 March on Washington and the “I have a dream speech” by The Rev. Martin Luther King, Jr. But as a white woman living through the events in the years that Cecil Gaines served in The White House, a lot of it was “the news” to me. I wasn’t living it in the way the characters lived it. I wasn’t forced to live with two faces, I wasn’t thrown in jail for expecting to be served in a restaurant, I wasn’t sprayed with fire hoses or screamed at by men in white robes. As I write this review I’m very aware of how different life was for African Americans during this part of our history. Forest Whitaker as Cecil Gaines, a man who hid his true self for most of his working life. Part of the power of this story is the juxtaposition of what Cecil Gaines was going through as a butler working in the rarefied air of The White House while his oldest son was riding buses across the South as a freedom rider. 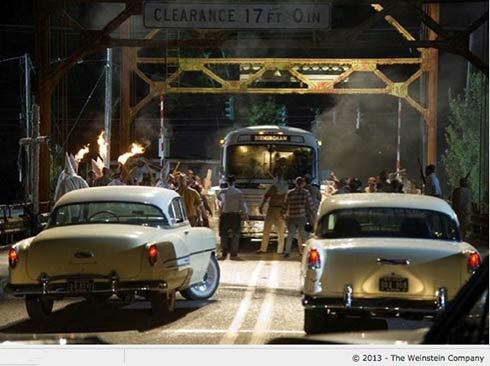 A bus full of freedom riders under attack. Cecil Gaines continued to do his job, a job that looked like a miracle of good fortune when he first was hired, while his oldest son was being arrested and beaten in places like Birmingham and Selma. These two things going on simultaneously spoke volumes about the past and the future, about courage and change. The story begins with young Cecil watching his father shot in cold blood because he dared speak to a white man after the white man raped Cecil’s mother. I don’t remember the date exactly, but I think it was in the 1920s. The story ends with the election of Barack Obama in 2008. Between those years, Cecil’s career in The White House spanned presidents from Eisenhower to Reagan. I think it was Eisenhower. Robin Williams definitely played Eisenhower. However, they showed actual TV news footage that was supposed to be Eisenhower, but I thought it was Harry Truman, so I am a bit confused about that part of the time sequence. 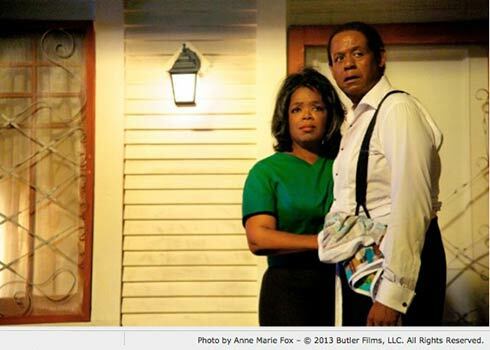 Oprah Winfrey and Forest Whitaker as Gloria and Cecil Gaines looking at smoke from nearby race riots. The cast is exemplary. Every one of the key parts of characters who get a lot of screen time is perfectly cast. Forest Whitaker as Cecil is flawless. Oprah Winfrey as his wife and mother of their two sons, David Oyelowo as the grown up Louis Gaines, Terrance Howard as a family friend, Cuba Gooding Jr. as another White House Butler – all outstanding. Major actors and actresses took tiny parts, just to be part of this story. I think anyone who read the script must have known what a powerful film this would be and was ready to be part of it. There will be numerous awards for this film, I’m sure of that. In addition to the civil right themes throughout there are the human dramas involving father and son relationships, family relationships, friendships, fidelity, alcoholism, pride, and respect. Perhaps you’re too young to have lived through all of the past 60 or 70 years of U.S. history. Perhaps you will miss some of the moments of recognition as to who the various characters in government and in the civil rights movement were from having known about them first hand during those years. Even more reason to watch this movie. You’ll learn something about the U.S – its failures, and its heroes. 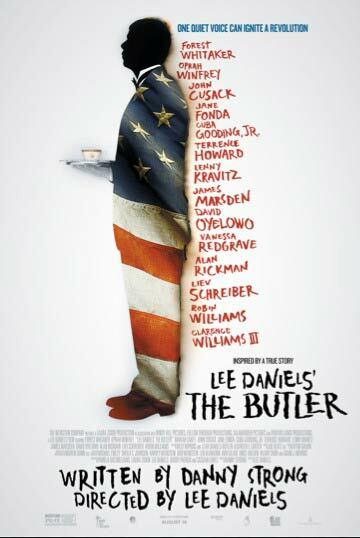 You’ll be moved by The Butler . I urge you to see it.